Know of any other Sun employees that are Apache members? It's great to be welcoming new folks to Sun, especially when they're brilliant people like Ted Leung and Nick Kew, both of whom, by the way, are members of the Apache Software Foundation. I met Ted at ApacheCon US 2004 in Vegas and he answered all my questions about the implications of moving Roller to the ASF. And I met Nick at ApacheCon EU 2006 in Dublin and we chatted, over a couple of pints of Guiness, about the perils and pleasures of working from home and other things. I'm also pretty damn pleased to be part of the MySQL welcoming committee, AKA the SunVisor program, and paired-up with Chuck Bell of MySQL. He's the author of Expert MySQL. I'll be answering his questions about Sun and, I hope, learning a thing or two about MySQL in the process. Join us and enjoy presentations and tours throughout the day of Sun's Modular Datacenter, the world's first datacenter in a box - a 6.1 meter (20 foot) shipping container. Also known as Project Blackbox, this is a virtualized datacenter optimized for extreme energy, space, and performance efficiency. It applies Sun's trademark innovation and network computing infrastructure expertise to engineer out complexity and provide a whole new alternative for quickly adding datacenter capacity anywhere it's needed, with the ability to move it as business needs change. Because of its modular, high density design, the Sun Modular Datacenter packs more heterogeneous compute power in less space than a traditional datacenter, and can be configured, deployed, and quickly modified and redeployed for another project virtually anywhere worldwide. Interested? The sign up is here. It was mentioned in Software VP Rich Green's presentation. I think that's just about all I can say on the topic. 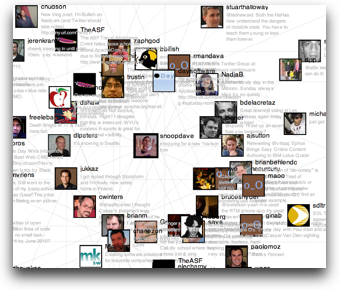 And by the way, the audio and slides for all of the SAS 2008 presentations are online now. Ian Murdock's presentation is especially good, as Redmonk's James Governor tweeted yesterday "Ian Murdoch (the ian of debian) is doing a phenomenal job of explaining what Linux, and distributions are. A great education for analysts." Here's a sampling of governance docs from some of Sun's many open source projects. I've listed them in order of what I feel to be, the most progressive (i.e. community governance) to least progressive (i.e. corporate control). I've also listed a key quote from each doc and made a brief comment about each. OpenSolaris governance: "The OpenSolaris Community has the authority and responsibility for all decisions" - seems to approach ASF style governance. OpenJDK interim governance: "The [board] shall be comprised of [5 and ] shall conduct its affairs in accordance with democratic principles and shall represent the interests of the Community. Two [members] shall be employees of Sun" - not final, but looking good. Netbeans governance: "In the case of an irresolvable dispute, there is a governance board of three people, who are appointed for six month terms." (2 appointed by community, 1 by Sun)." - sounds pretty good, but the doc seems a little vague. SunGrid governance: "The Board positions include the Community Leader, the Community Site Manager, and four general members, two Sun members and from the independent developer Community." - sounds good, again doc seems a little vague. Glassfish governance: "The GlassFish project has an overall Project Lead ... appointed by Sun" - Sun has final say. OpenSSO governance (draft): "Project Managers make the final decision ... are appointed by Sun" - Sun has final say. 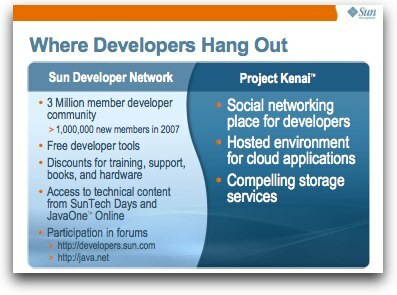 OpenDS governance: The OpenDS project has single, overall Project Lead [who is] appointed by Sun Microsystems." - Sun has final say. Mobile and embedded: "Sun may change its appointed Governance Board members at any time" - Sun has final say. Looks to me like the trend is towards community governance and the most important projects are the ones getting the most attention and the most progressive governance. That's good and I sincerely hope the trend continues. Tri-LUG announcement: Pat Patterson from Sun Microsystems will provide us with a developer perspective on digital identity, starting from the emergence of LDAP in the 90s, through single sign-on, SAML and the Liberty Alliance protocols to recent developments such as OpenID, Cardspace and OAuth. The emphasis will be on understanding the protocols and how they are implemented in the real world, with a particular focus on deciding which (if any!) approach to select for a given project. Pat Patterson is a federation architect at Sun Microsystems, focusing on federation, identity-enabled Web services and OpenSSO, Sun's open-source implementation of those technologies. Pat's blog centers on identity-related topics. Looks like a great talk and I've always wanted to meet SuperPat, so I'll be there. Linda Skrocki: I find it interesting that although trust is a two way street, the focus in the blogoshpere is often on companies going out on a limb by trusting employees to blog on a corporate sponsored site, but the fact is, employees also go out on a limb for companies when they contribute content to the company blog site (whether it's personal or not). Some wonderful insights from blogs.sun.com PM Linda Skrocki, read the whole post. She's writing about Sun's 2007 Corporate Responsbility Report. Todays news that Sun's stock ticker will change from SUNW to JAVA was met with pretty mixed reactions both inside and outside of Sun. On the day of the announcement, the more than 170 comments on Jonathan Schwartz's blog announcement were mostly negative and though there are some positive reactions in the interblogonet, they come mostly from Sun employees. Below are the posts that I've seen in my feed reader so far. Barton George (Sun): "bold move"
David Van Couvering (Sun): "Wow. Bold, audacious, wild." Nick Wooler (Sun): "reinforces the brand"
Jonathan Hawkins (Sun): "good idea"
Bruce Hill (Sun): "certainly a cooler name"
Glynn Foster (Sun): "massively supportive"
Jason Beloro (Sun) "already a success"
Fake Schwartz: "we're open sourcing the stock as well!" Marc Kossa (Sun): "I like it !" Alexis Moussine-Pouchkine (Sun): "turning out to be a very good communication strategy"
Geoff Arnold (formerly Sun): "This is simply silly"
Dan Latcher (Sun): "don't see the point"
Murphee's Rant: "Run for the hills, folks! " Paul Krill, InfoWorld: "likely to cause confusion"
Sanjiva Weerawarana (ASF): "incredibly bad idea"
James Robertson: "dilutes Sun's brand"
Daring Fireball: "shuffling the deck chairs on the Titanic"
Catherine Helzerman: "Java isnât just Sun"
Tim Bray (Sun): "I hate it." James Gosling (Sun): "totally bizarre"
Kevin Chu (Sun): "In light of our change..."
Jim Jagielski : "The next several months will be very telling indeed." Garbage Collection blog (Sun): "Maybe it might work"
Madhan Kumar Balasubramanian (Sun): "What is this?" C. Enrique Ortiz: "[Sun] is very committed to Java"
What do I think? I'm not sure what I think of the change. The ticker SUNW was out of date because "workstations" are so 80s man, so it's a good thing to update it. And Java ISVs like BlogBridge should like the vote of confidence in Java. On the negative side, it's easy to search for SUNW to get Sun news and that won't work as well with the new ticker. And Java's not all Sun does. One more point. I'm not sure most folks really care what the ticker name is. If they did, don't you think Sun would have changed it years ago? By the way. I didn't mean the hit the post button on this entry so soon, but it's out there now so I might as well let it stand. I'll update over the next day or two as reactions roll in. UPDATE: Ed Burnette has a positive, neutral, negative and funny breakdown of his 25 favorite comments from Jonathan's blog post. He says that "Stockholders and employees are among the most vocal critics." of the change. Sun is throwing another JavaOne bloggers bash at Thirsty Bear this year, at 6PM on Wednesday night. I'll be there and I hope to see other Roller users and developers there too.